Exfoliative dermatitis (ED) is a definitive term that refers to a scaling erythematous dermatitis involving 90% or more of the cutaneous surface. Exfoliative dermatitis is characterized by erythema and scaling involving the skin's surface and often obscures the primary lesions that are important clues to understanding the evolution of the disease. Clinicians are challenged to find the cause of exfoliative dermatitis by eliciting the history of illness prior to erythema and scaling, by probing with biopsies, and by performing blood studies. See the images below. Exfoliative dermatitis diffuse skin involvement. Exfoliative dermatitis close-up view showing erythema and scaling. The term red man syndrome is reserved for idiopathic exfoliative dermatitis, in which no primary cause can be found, despite serial examinations and tests. Idiopathic exfoliative dermatitis is characterized by marked palmoplantar keratoderma, dermatopathic lymphadenopathy, and a raised level of serum immunoglobulin E (IgE) and is more likely to persist than other types. The term l'homme rouge refers to exfoliative dermatitis often secondary to cutaneous T-cell lymphoma. Erythrodermic mycosis fungoides should be distinguished from leukemic Sézary syndrome with erythroderma. The historic classification of exfoliative dermatitis into Wilson-Brocq (a chronic process associated with exacerbation and remissions), Hebra or pityriasis rubra (relentlessly progressive disease), and Savill (self-limiting) types lacks any clinical significance. An increased skin blood perfusion occurs in exfoliative dermatitis (ED) that results in temperature dysregulation (resulting in heat loss and hypothermia) and possible high-output cardiac failure. The basal metabolic rate rises to compensate for the resultant heat loss. Fluid loss by transpiration is increased in proportion to the basal metabolic rate. The situation is similar to that observed in patients following burns (negative nitrogen balance characterized by edema, hypoalbuminemia, loss of muscle mass). No racial predilection is reported for exfoliative dermatitis (ED). The prognosis of exfoliative dermatitis depends largely on underlying etiology. The disease course is rapid if it results from drug allergy, lymphoma, leukemia, contact allergens, or staphylococcal scalded skin syndrome. A study  of pediatric patients (aged < 19 y) found that fever is a poor prognostic marker and may indicate a susceptibility to rapid deterioration. In this group, those with the following characteristics have a higher tendency to develop hypotension: age 3 years or younger, ill appearance, vomiting, glucose level of 110 mg/dL or less, calcium value of 8.6 mg/dL or less, platelet count of 300,000/μL or less, elevated creatinine value, polymorphonuclear leukocyte count of 80% or greater, and the presence of a focal infection. The risk of toxic shock syndrome is increased especially in children with erythroderma and fever who have the following additional features: age of 3 years or younger, ill appearance, elevated creatinine value, and hypotension upon arrival. The disease course is gradual if it results from generalized spread of a primary skin disease (eg, psoriasis, atopic dermatitis). The mean duration of illness typically is 5 years, with a median of 10 months. Mortality varies according to the disease's cause. In a study of 91 of 102 patients with exfoliative dermatitis by Sigurdsson et al,  a mortality rate of 43% was observed. Only 18% of the deaths were directly related to exfoliative dermatitis. In 74% of the deaths, causes unrelated to exfoliative dermatitis were implicated. Educate patients on the specifics of the underlying cause of their exfoliative dermatitis (ED) and the importance of diligent follow-up management as indicated. Patients should be educated on the benefits of a healthy lifestyle and to immediately treat occurrences of erythroderma to better manage their diseases in the long term. Patients should be advised to avoid the use of and/or contact with of irritant soaps, lotions, detergents, and chlorine, and special considerations should be made for allergies, especially for patients with atopic dermatitis. Excessive sweating should also be avoided. Spicknall KE. Sézary syndrome-clinical and histopathologic features, differential diagnosis, and treatment. Semin Cutan Med Surg. 2018 Mar. 37 (1):18-23. [Medline]. Verma P, Bhattacharya SN, Banerjee BD, Khanna N. Oxidative stress and leukocyte migration inhibition response in cutaneous adverse drug reactions. Indian J Dermatol Venereol Leprol. 2012 Sep-Oct. 78(5):664. [Medline]. Ohga Y, Bayaraa B, Imafuku S. Chronic idiopathic erythroderma of elderly men is an independent entity that has a distinct TARC/IgE profile from adult atopic dermatitis. Int J Dermatol. 2018 Jun. 57 (6):670-674. [Medline]. Mateo S, García-Martínez FJ, Sánchez-Aguilar D, Amarelo J, Toribio J. Psoriasiform exfoliative erythroderma induced by golimumab. Clin Exp Dermatol. 2014 Aug 22. 39(7):813-15. [Medline]. Nishizawa A, Igawa K, Teraki H, Yokozeki H. Diffuse disseminated lichenoid-type cutaneous sarcoidosis mimicking erythroderma. Int J Dermatol. 2014 Aug. 53(8):e369-70. [Medline]. Doukaki S, Aricò M, Bongiorno MR. Erythroderma related to the administration of 99mTc-sestamibi: the first report. J Nucl Cardiol. 2010 Jun. 17(3):520-2. [Medline]. Rolfes N, Lümmen G. Hypertension and palmar plantar erythroderma. Management of adverse events of angiogenetic inhibitors in the treatment of renal cell carcinoma. [Article in German]. Urologe A. 2011 Nov. 50(11):1387-91. [Medline]. Huang HY, Luo XQ, Chan LS, Cao ZH, Sun XF, Xu JH. Cutaneous adverse drug reactions in a hospital based Chinese population. Clin Exp Dermatol. 2011 Mar. 36(2):135-41. [Medline]. Zhang B, Bolognia J, Marks P, Podoltsev N. Enhanced skin toxicity associated with the combination of clofarabine plus cytarabine for the treatment of acute leukemia. Cancer Chemother Pharmacol. 2014 Aug. 74(2):303-7. [Medline]. Zhang JC, Sun YT. Efavirenz-induced exfoliative dermatitis. Scand J Infect Dis. 2013 Jan. 45(1):70-2. [Medline]. Ram-Wolf C, Mahé E, Saiag P. Escitalopram photo-induced erythroderma. J Eur Acad Dermatol Venereol. 2008 Aug. 22(8):1015-7. [Medline]. Mumoli N, Luschi R, Camaiti A, Cei M, Bagnoni G, Biondi A. 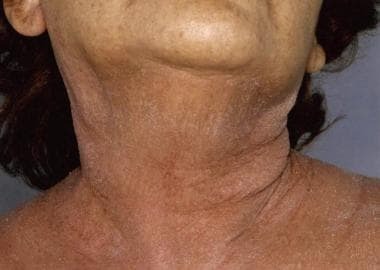 Severe exfoliative dermatitis caused by esomeprazole. J Am Geriatr Soc. 2011 Dec. 59(12):2377-8. [Medline]. Dua R, Sindhwani G, Rawat J. Exfoliative dermatitis to all four first line oral anti-tubercular drugs. Indian J Tuberc. 2010 Jan. 57(1):53-6. [Medline]. Lee HY, Tay LK, Thirumoorthy T, Pang SM. Cutaneous adverse drug reactions in hospitalized patients. Singapore Med J. 2010 Oct. 51(10):767-74. [Medline]. Reynaud F, Giraud P, Cisterne JM, Verdier D, Kouchakipour Z, Hermelin A, et al. Acute immune allergic interstitial nephritis after treatment with fluindione. Seven cases. [Article in French]. Nephrol Ther. 2009 Jul. 5(4):292-8. [Medline]. Tamer E, Gur G, Polat M, Alli N. Flare-up of pustular psoriasis with fluoxetine: possibility of a serotoninergic influence?. J Dermatolog Treat. 2009. 20(3):1-3. [Medline]. Ozuguz P, Kacar SD, Ozuguz U, Karaca S, Tokyol C. Erythroderma secondary to gliclazide: a case report. Cutan Ocul Toxicol. 2014 Dec. 33(4):342-4. [Medline]. Hulmani M, Nandakishore B, Bhat MR, Sukumar D, Martis J, Kamath G, et al. Clinico-etiological study of 30 erythroderma cases from tertiary center in South India. Indian Dermatol Online J. 2014 Jan. 5(1):25-9. [Medline]. Kumar S, Mahajan BB, Kaur S, Banipal RP, Singh A. Imatinib mesylate induced erythroderma: A rare case series. J Cancer Res Ther. 2015 Oct-Dec. 11(4):993-6. [Medline]. Markvardsen LH, Jakobsen J. Exfoliative dermatitis as a side effect of intravenous immunoglobulin treatment. [Article in Danish]. Ugeskr Laeger. 2011 Oct. 173(43):2725-6. [Medline]. Igawa K, Konishi M, Moriyama Y, Fukuyama K, Yokozeki H. Erythroderma as drug eruption induced by intravesical mitomycin C therapy. J Eur Acad Dermatol Venereol. 2015 Mar. 29(3):613-4. [Medline]. Choi CU, Rha SW, Suh SY, Kim JW, Kim EJ, Park CG, et al. Extensive exfoliative dermatitis induced by non-ionic contrast medium Iodixanol (Visipaque) used during percutaneous coronary intervention. Int J Cardiol. 2008 Feb. 124(2):e25-7. [Medline]. Vaish AK, Tripathi AK, Gupta LK, Jain N, Agarwal A, Verma SK. An unusual case of DRESS syndrome due to leflunomide. BMJ Case Rep. 2011 Sep. 2011:[Medline]. Sadeghpour M, Bunick CG, Robinson DM, Galan A, Tigelaar RE, Imaeda S. Midodrine-induced acute generalized exanthematous pustulosis. Cutis. 2014 May. 93(5):E17-20. [Medline]. Arai S, Mukai H. Erythroderma induced by morphine sulfate. J Dermatol. 2011 Mar. 38(3):288-9. [Medline]. Bhandarkar AP, Kop, PB, Pai VV. Nevirapine induced exfoliative dermatitis in an HIV-infected patient. Indian J Pharmacol. 2011 Nov-Dec. 43(6):738-739. [Medline]. Sánchez-Borges M, González-Aveledo L. Exfoliative erythrodermia induced by pantoprazole. Allergol Immunopathol (Madr). 2012 May-Jun. 40(3):194-5. [Medline]. Bilaç C, Müezzinoğlu T, Ermertcan AT, Kayhan TC, Temeltaş G, Oztürkcan S, et al. Sorafenib-induced erythema multiforme in metastatic renal cell carcinoma. Cutan Ocul Toxicol. 2009. 28(2):90-2. [Medline]. Smith EV, Shipley DR. Severe exfoliative dermatitis caused by strontium ranelate: two cases of a new drug reaction. Age Ageing. 2010 May. 39(3):401-3. [Medline]. Eyler JT, Squires S, Fraga GR, Liu D, Kestenbaum T. Two cases of acute generalized exanthematous pustulosis related to oral terbinafine and an analysis of the clinical reaction pattern. Dermatol Online J. 2012 Nov. 18(11):5. [Medline]. Nakamura M, Tokura Y. Tocilizumab-induced erythroderma. Eur J Dermatol. 2009 May-Jun. 19(3):273-4. [Medline]. Rowe CJ, Robertson I, James D, McMeniman E. Warfarin-induced erythroderma. Australas J Dermatol. 2015 Feb. 56(1):e15-7. [Medline]. Sarkar R, Garg VK. Erythroderma in children. Indian J Dermatol Venereol Leprol. 2010 Jul-Aug. 76(4):341-7. [Medline]. Fraitag S, Bodemer C. Neonatal erythroderma. Curr Opin Pediatr. 2010 Aug. 22(4):438-44. [Medline]. Byer RL, Bachur RG. Clinical deterioration among patients with fever and erythroderma. Pediatrics. Dec 2006. 118(6):2450-60. [Medline]. Sigurdsson V, Toonstra J, Hezemans-Boer M, van Vloten WA. Erythroderma. A clinical and follow-up study of 102 patients, with special emphasis on survival. J Am Acad Dermatol. 1996 Jul. 35(1):53-7. [Medline]. Lancrajan C, Bumbacea R, Giurcaneanu C. Erythrodermic atopic dermatitis with late onset--case presentation. J Med Life. 2010 Jan-Mar. 3(1):80-3. [Medline]. Yuan XY, Guo JY, Dang YP, Qiao L, Liu W. Erythroderma: A clinical-etiological study of 82 cases. Eur J Dermatol. 2010 May-Jun. 20(3):373-7. [Medline]. Jusufbegovic D, Char DH. Clinical variability of ocular involvement in mycosis fungoides. JAMA Ophthalmol. 2015 Mar. 133(3):341-3. [Medline]. Clark RA, Shackelton JB, Watanabe R, Calarese A, Yamanaka K, Campbell JJ, et al. High-scatter T cells: a reliable biomarker for malignant T cells in cutaneous T-cell lymphoma. Blood. 2011 Feb 10. 117(6):1966-76. [Medline]. Kirsch IR, Watanabe R, O'Malley JT, Williamson DW, Scott LL, Elco CP, et al. TCR sequencing facilitates diagnosis and identifies mature T cells as the cell of origin in CTCL. Sci Transl Med. 2015 Oct. 7(308):308ra158. [Medline]. Sbidian E, Battistella M, Rivet J, Flageul B, Molina JM, Joly P, et al. Remission of severe CD8(+) cytotoxic T cell skin infiltrative disease in human immunodeficiency virus-infected patients receiving highly active antiretroviral therapy. Clin Infect Dis. 2010 Sep. 51(6):741-8. [Medline]. Griffiths TW, Stevens SR, Cooper KD. Acute erythroderma as an exclusion criterion for idiopathic CD4+ T lymphocytopenia. Arch Dermatol. 1994 Dec. 130(12):1530-3. [Medline]. Bosseila M, Mahgoub D, El-Sayed A, Salama D, Abd El-Moneim M, Al-Helf F. Does fluorescence diagnosis have a role in follow up of response to therapy in mycosis fungoides?. Photodiagnosis Photodyn Ther. 2014 Dec. 11(4):595-602. [Medline]. Scrivener Y, Cribier B, Le Coz C, Boehm N, Jelen G, Heid E, et al. Erythroderma with immunoglobulin deposits along the basal membrane. Pemphigoid erythroderma? [Article in French]. Ann Dermatol Venereol. 1998 Jan. 1. 25(1):13-7. [Medline]. Gros A, Laharanne E, Vergier M, Prochazkova-Carlotti M, Pham-Ledard A, Bandres T, et al. TP53 alterations in primary and secondary Sézary syndrome: A diagnostic tool for the assessment of malignancy in patients with erythroderma. PLoS One. 2017. 12 (3):e0173171. [Medline]. Megna M, Sidikov AA, Zaslavsky DV, Chuprov IN, Timoshchuk EA, Egorova U, et al. The role of histological presentation in erythroderma. Int J Dermatol. 2017 Apr. 56 (4):400-404. [Medline]. Ram-Wolff C, Martin-Garcia N, Bensussan A, Bagot M, Ortonne N. Histopathologic diagnosis of lymphomatous versus inflammatory erythroderma: a morphologic and phenotypic study on 47 skin biopsies. Am J Dermatopathol. 2010 Dec. 32(8):755-63. [Medline]. Lee WK, Kim GW, Cho HH, Kim WJ, Mun JH, Song M, et al. Erythrodermic psoriasis treated with golimumab: a case report. Ann Dermatol. 2015 Aug. 27(4):446-9. [Medline]. Wang J, Wang YM, Ahn HY. Biological products for the treatment of psoriasis: therapeutic targets, pharmacodynamics and disease-drug-drug interaction implications. AAPS J. 2014 Sep. 16(5):938-47. [Medline]. Sanford M, McKeage K. Secukinumab: first global approval. Drugs. 2015 Feb. 75(3):329-38. [Medline]. Alberti-Violetti S, Talpur R, Schlichte M, Sui D, Duvic M. Advanced-stage mycosis fungoides and Sézary syndrome: survival and response to treatment. Clin Lymphoma Myeloma Leuk. 2015 Jun. 15(6):e105-12. [Medline]. Cather JC, Crowley JJ. Use of biologic agents in combination with other therapies for the treatment of psoriasis. Am J Clin Dermatol. 2014 Dec. 15(6):467-78. [Medline]. Rosenbach M, Hsu S, Korman NJ, Lebwohl MG, Young M, Bebo BF Jr, et al. Treatment of erythrodermic psoriasis: from the medical board of the National Psoriasis Foundation. J Am Acad Dermatol. 2010 Apr. 62(4):655-62. [Medline]. Armstrong AW, Bagel J, Van Voorhees AS, Robertson AD, Yamauchi PS. Combining biologic therapies with other systemic treatments in psoriasis: evidence-based, best-practice recommendations from the Medical Board of the National Psoriasis Foundation. JAMA Dermatol. 2015 Apr. 151(4):432-8. [Medline]. Al Hothali GI. Review of the treatment of mycosis fungoides and Sézary syndrome: A stage-based approach. Int J Health Sci (Qassim). 2013 Jun. 7(2):220-39. [Medline]. Rupoli S, Canafoglia L, Goteri G, Leoni P, Brandozzi G, Federici I, et al. Results of a prospective phase II trial with oral low dose bexarotene plus photochemotherapy (PUVA) in refractory and/or relapsed patients with mycosis fungoides. Eur J Dermatol. 2015 Dec 16. [Epub ahead of print]. [Medline]. Sokolowska-Wojdylo M, Florek A, Zaucha JM, Chmielowska E, Giza A, Knopinska-Posluszny W, et al. Polish Lymphoma Research Group experience with bexarotene in the treatment of cutaneous T-cell lymphoma. Am J Ther. 2014 Apr 11. [Epub ahead of print]. [Medline]. Chung CG, Poligone B. Cutaneous T cell lymphoma: an update on pathogenesis and systemic therapy. Curr Hematol Malig Rep. 2015 Dec. 10(4):468-76. [Medline]. Galper SL, Smith BD, Wilson LD. Diagnosis and management of mycosis fungoides. Oncology (Williston Park). 2010 May. 24(6):491-501. [Medline]. Wilcox RA. Cutaneous T-cell lymphoma: 2016 update on diagnosis, risk-stratification, and management. Am J Hematol. 2016 Jan. 91(1):151-65. [Medline]. Humme D, Nast A, Erdmann R, Vandersee S, Beyer M. Systematic review of combination therapies for mycosis fungoides. Cancer Treat Rev. 2014 Sep. 40(8):927-33. [Medline]. Hughes CF, Khot A, McCormack C, Lade S, Westerman DA, Twigger R, et al. Lack of durable disease control with chemotherapy for mycosis fungoides and Sézary syndrome: a comparative study of systemic therapy. Blood. 2015 Jan. 125(1):71-81. [Medline]. Duvic M, Olsen EA, Breneman D, Pacheco TR, Parker S, Vonderheid EC, et al. Evaluation of the long-term tolerability and clinical benefit of vorinostat in patients with advanced cutaneous T-cell lymphoma. Clin Lymphoma Myeloma. 2009 Dec. 9(6):412-6. [Medline]. Prince HM, Dickinson M, Khot A. Romidepsin for cutaneous T-cell lymphoma. Future Oncol. 9(12). 2013 Dec.:1819-27. [Medline]. Foss F, Advani R, Duvic M, Hymes KB, Intragumtornchai T, Lekhakula A, et al. A Phase II trial of Belinostat (PXD101) in patients with relapsed or refractory peripheral or cutaneous T-cell lymphoma. Br J Haematol. 2015 Mar. 168(6):811-9. [Medline]. Guttman-Yassky E, Dhingra N, Leung DY. New era of biologic therapeutics in atopic dermatitis. Expert Opin Biol Ther. 2013 Apr. 13(4):549-61. [Medline]. Zattra E, Belloni Fortina A, Peserico A, Alaibac M. Erythroderma in the era of biological therapies. Eur J Dermatol. 2012 Mar-Apr. 22(2):167-71. [Medline]. Zackheim HS, Kashani-Sabet M, Hwang ST. Low-dose methotrexate to treat erythrodermic cutaneous T-cell lymphoma: results in twenty-nine patients. J Am Acad Dermatol. 1996 Apr. 34(4):626-31. [Medline]. Sigurdsson V, Toonstra J, van Vloten WA. Idiopathic erythroderma: a follow-up study of 28 patients. Dermatology. 1997. 194(2):98-101. [Medline]. Patel S, Patel T, Kerdel FA. The risk of malignancy or progression of existing malignancy in patients with psoriasis treated with biologics: case report and review of the literature. Int J Dermatol. 2015 Dec. [Epub ahead of print]. [Medline]. Hsu L, Armstrong AW. Anti-drug antibodies in psoriasis: a critical evaluation of clinical significance and impact on treatment response. Expert Rev Clin Immunol. 2013 Oct. 9(10):949-58. [Medline].